(A) Each voucher must be presented in accordance with any terms stated. Please read carefully before redemption. (B) This entire coupon book and its vouchers are transferable and may be used by anyone in accordance with the terms stated. (C) No adjustments, monetary or otherwise, will be made if the total amount/value of voucher is not used. (D) In the event that any business with voucher(s) in this book ceases operations, the voucher(s) for the business shall be deemed void. (E) All merchants participating in this book and on the mobile app have signed legal contracts for the services and/or goods they are providing. Select Enterprises, the University of Wisconsin-Madison and its Athletic Department and/or any subsidiaries, employees, officers, directors, representative and agents thereof will not assume liability or be responsible in the event that any participating merchants breach their contract; however, Select Enterprises will make every attempt to secure compliance. Also, the above referenced parties assume no liability for any participating merchant who cannot fulfill their obligations within this book or on the mobile app for any reason such as breach of contract, fire, death, bankruptcy, change of ownership, acts of God, casualties, strikes, etc., or any other circumstances beyond our control. Select Enterprises, the University of Wisconsin-Madison and its Athletic Department are not responsible for any coupon redemption within the book or mobile app or any online registration forms, mail-in registration forms, gift certificates, premium coupons, mobile coupons, etc. that are lost, delayed, undeliverable, etc. by the US Postal Service, by an electronic malfunction, etc. ; nor are they liable for any gifts, prizes, coupons, etc. that may have been awarded or delivered had any of the above been properly received or delivered. (F) Despite our best efforts to ensure accuracy, printing errors may occur. We reserve the right to correct such errors, at any time, verbally or in writing, even if it affects an existing redemption. 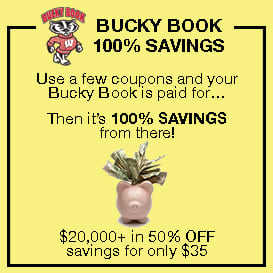 (G) Bucky Book certificates may not be RESOLD individually, as a group or in book form without expressed written approval by Select Enterprises. 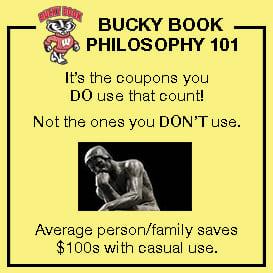 (H) Any attempt to fraudulently duplicate or copy any coupons in this Book or on the mobile app is illegal and the Bucky Book and any participating Merchants will prosecute to the full extent of the law!! 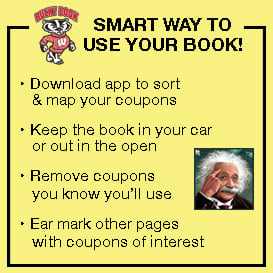 (I) Bucky Book coupons can NOT be combined with any mobile coupons for redemption!